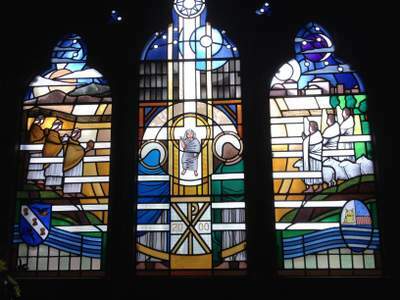 A community funded project,instigated by the Parish Council and embraced by the Church,to install a stained glass windo centrally on the south side of the church to commemorate and celebrate the new millenium. The initial development of the project involved Year 5 pupils from the village primary school,who visited the church to study the existing stained glass windows, accompanied by the deputy head teacher, Mrs Christine Thomas, and Rev’d Stephen Wilson. Mr Arthur Birchall, a resident in the village with some experience of designing and making stained glass windows, also gave the children some background on its history and production techniques. Essentially “childrenof the millenium”, the Year 5 children were old enough to understand the concept, produce ideas and would be able to follow the project through to their last summer term in 2000, when it is planned to install and dedicate the window as they move on to secondary education. Mostly working in pairs, the pupils produced 17 completed paintings, with the process of stained glass making in mind, which contained a variety of images based on the Nativity as described in the gospels of St Matthew and St Luke. The Nativity was considered to be the most appropriate them for the millenium window, 2000 years since the birth of Christ, and it also complements the other existing Christo-centric stained glass windows within the church. A suggestion that there may also be some reference to the local surroundings and environment brought other images to some pupil’s pictures. At this point I was brought into the process and commissioned to design the final window with the brief to try and involve the children and their preliminary work in some way. Inevitably there were a number of similar elements and ideas within the children’s work with some significantly strong images which I initially thought I may be able to use direct. This however caused all sort of problems involving selection, scale, style, authorship, and perhaps ultimately, suitability. The main drive for my inspiration which I have derived from the children’s work has come the selection of specific elements or ideas taken from different individual works and which through my intervention has the necessary unity of single authorship. It is, however, very likely that the origenators will recognise their contributions to my overall concept and its composite parts. Although the majority of my work for the church has been produced using symbolic iconography, the chosen Nativity theme, the children’s work and earlier stated preferences has led me to develop a primary figurative design. Without trying to emulatethe children’s work I have necertheless endeavoured to present the images in a way which parallels the directness of theie expression and have kept the drawing fairly basic and two-dimensional;which is also sympathetic to the medium. The design for the window contains a sequence of related events which are intended to operate as one image seen in a single moment. The window is treated as a triptych with central and flanking lights. The central light contains The Christ Child lying in a manger wrapped in swaddling clothes and protected from the night sky by thr roof of a stable, for there was no room at the inn. The Blessed Virgin Mary and Joseph are in attendance; The Holy Family. The infant Jesus is depicted within a central beam of light which links with the guiding star above, the celestrial to the terrestrial, and places him in another dimension. He is shown lying in a manger but the image is projected into a position which also alludes to him enthroned in glory, as depicted in the east window. The structure of the manger incorporateshis sign (X,P) and an indication of a cross conveys the promise of his ultimate sacrifice. From this central image ambers, golds and whites suggest a radiant light emanating from him, The Light of the World, which will be complimented and amplified by the southerly aspect of the window. The figures of Mary and Joseph are portrayed as broken silhouettes as are the figures of the wise men and shepherds in other lights, seen as if through a haze caused by the bright light which permeates the total image of the window. The left hand, east, light amplified by the rising sun, infers the origins of the wise mens’ journey through a mountainous and arid landscape, bearing gifts of gold, frankincense and myrrh. The landscape becomes more hospitable in the lower secton suggesting the successful accomplishment of their journey and a river flowing between the two outer lights infers the potential of Christian baptism and associates with the local River Weaver included in several of the children’s works. The right hand light contains the shepherds under a night sky but lit by an accentuated white light to represent The Angel of the Lord and the glory of The Lord that shone around them as they were informed of the birth of The Saviour, which is Christ the Lord, in the city of David depicted on the horizon. The hint of a more arable landscape in this light also alludes to the surrounding areas of Moulton and there are three trees to represent The Trinity, as found in a number of the pupil’s paintings. In the outer and lower corner of the left hand light, the badge of Moulton Primary School is reproduced. In a similar position opposite is the seal of Moulton Parish Council.